Stuck in the Suburban Jungle. New York City is the most fabulous area in NY. and eastern Long Island a closer second and nothing else matters. In the opinion of most, but not all. Although, the eastern side of the island (being the north and south forks) are the more beautiful parts of long island, even safe to say the more chic. Less commercial eyesores and more lovely main streets with shops and privately owned cafes and boutiques. Despite its renowned reputation and all the fine restaurants, vineyards, beaches, pies, farm-stands, waterfront venues and large amounts of tourists- it is still suburbia. That being said I can't always dress as fab as I'd like if I lived in a big city, which would call for head to toe chic-glam everyday, you never know when you could meet destiny. While out here, people tend to dress all the same- for the most part. If you are dressed-to-the-nines prepare for the stares. For more low-key days I like to take a fun or bold detail to incorporate it into a casual look. Such as a leopard trim or a flashy pair of flats. Remember, the everyday never has to be boring. Of course I'll follow you back. 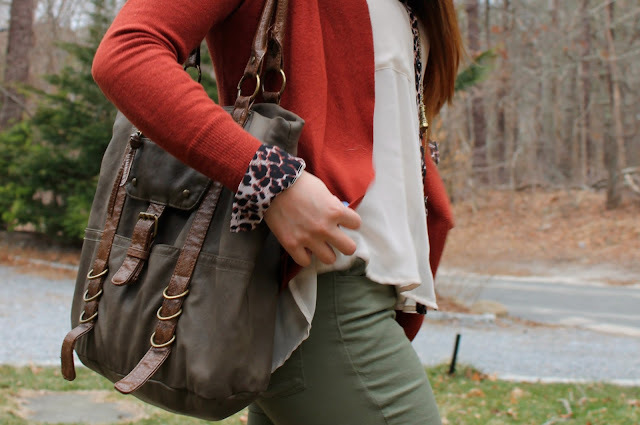 Love the color palette in this look. Looks like everything was just meant to be paired together! I love the shades of green! Really great on you! 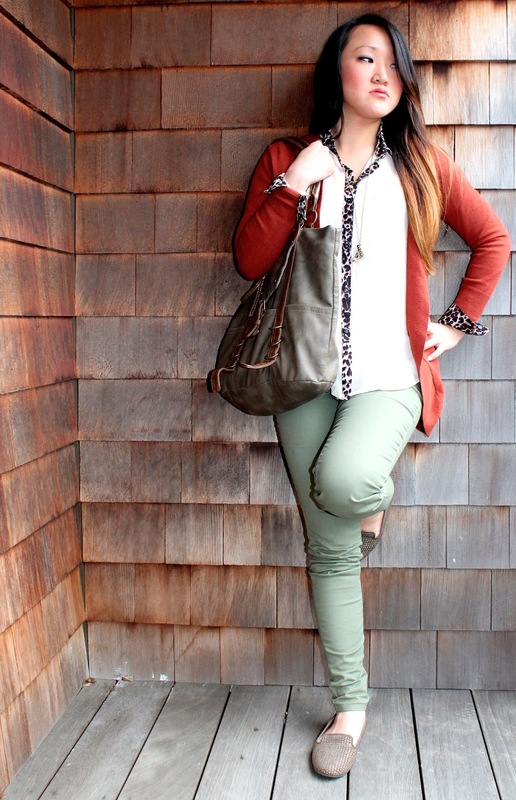 I'm sort of obsessed with these olive pants right now. I agree, a small fun detail is the best way to shake up a look on a day-to-day basis. Hi dear :) lovely outfit! I love that shoes! :) Thanks for your comment, I follow you back! ohh i like leopard print :3 nice style! Nice outfit and lovely shirt, is so cute! Aw so sweet- thank you, doll. First of all love your hair. I'm an ombre hair girl too:-) Great colour of your jeans and your necklace is just adorable. I got it in march and don't know how I've ever lived without it. followed you! thanks for the visit, now it's your turn I wait for you<!! Followed you back, keep in touch!